Zynga and Facebook are all lovey-dovey again thanks to a new five-year deal that will actually expand the use of Facebook Credits, Facebook's universal virtual currency, in Zynga games. It's been a rough patch lately for Facebook and Zynga, and for awhile it looked like the world's foremost social network and its premiere gaming partner might actually go their separate ways. But the brinkmanship appears to be over, as the two casual colossi have kissed and made up and promised to be friends for at least the next half-decade. The specifics of the new deal haven't been revealed but the most interesting aspect would appear to be the agreement to expand the use of Facebook Credits in Zynga games. 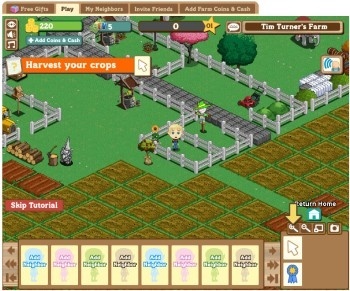 Facebook's desire to replace Zynga's game-specific virtual currency with its own, and take a 30 percent cut off the top, was a major bone of contention, so it's a good bet that some sort of deal was made to bring Zynga on board. Or maybe Zynga, for all its passive-aggressive posturing, just didn't have the stones to actually take its act on the road. Whatever the case, it's a good ending for both sides. This kind of fight never ends well for anyone and the fact that Zynga and Facebook are heavily co-dependent no doubt went a long way toward bringing them both the table. A percentage of something is a whole lot better than all of nothing, after all, and let's face it: There's more than enough money being spread around here to keep everyone happy.